On December 25, 2005, from the Baikonur Launch Site, there were three launched three navigation satellites belonging to the GLONASS system: one GLONASS satellite (the last of the first generation) and two new GLONASS-M satellites (see photo, above left). This launch ensured the possibility of completing the flight tests for the modernized GLONASS system and performing the direct navigation determination using four GLONASS-M satellites simultaneously (two of these GLONASS-M satellites were launched earlier in 2003 and 2004). Today, the orbital GLONASS constellation includes 16 satellites (12 GLONASS satellites and 4 GLONASS-M satellites). 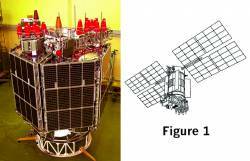 This article discusses the planned modernization of the GLONASS satellite navigation system with particular emphasis on the improved design of GLONASS-M satellites. The first satellite of the Russian navigation system GLONASS was launched on October 12, 1982, and the system was introduced into operation in 1993, being deployed to the complete constellation of 24 satellites in 1995. With 24 satellites in orbit, the GLONASS system can ensure the continuous global navigation for military and civil users by employing two types of signal: a signal of standard accuracy for civil users and a high-accuracy signal for military users. When Russia faced new economical conditions in the 1990s, the financing for the space industry was reduced leading to the orbital GLONASS constellation reduction and decrease of its effectiveness. Bearing in mind that the Space Navigation System GLONASS is a part of the national patrimony of Russia, in 2001 the president of Russian and the government of the Russian Federation ratified the policy directives setting out the intent to conclusively preserve and develop this navigation system. The Federal Target Program “Global navigation system” is one of these documents. This program has been developed to be completed for the decade (from 2002 to 2011). During this period certain research and development activities shall be performed, including the ground experimental development for the prospective navigation spacecraft as well as flight and design tests; the ground control segment for the navigation system shall be modernized; the orbital constellation with the nominal number of satellites (24) shall be replenished. The 10-year program of creation and operation of the modernized Russian Navigation System GLONASS space segment covers two stages: the current GLONASS-M satellites – at the first stage, and the proposed GLONASS-K satellites – at the second stage. • extension of the range of mission tasks to be performed. With the preceding conditions implemented, there is kept the orbital configuration established earlier (three planes, with eight satellites in each plane), the orbital parameters (Н=19,400 km, i=64.8°, е=0) and the quantity of satellites in the nominal constellation (24 satellites). This enables the GLONASS operators to maintain the principles and methods of ballistic support of the satellite constellation and to provide the high-accuracy ephemeris. 5) increased operational life of a satellite — up to seven years. A GLONASS-М satellite can be injected into orbit by a cluster launch (three satellites by a single launch vehicle — see photo at the top of this article) from the Baikour Launch Site (using Proton LV and Breeze-M Booster) or by a single satellite launch from Plesetsk Launch Site using Soyuz-2 LV and Fregat Booster. A GLONASS-М satellite design (see Figure 1, above right) is based on a pressurized container inside which comfortable temperature conditions are maintained, ensuring the temperature range from 0 to 40°С, and local areas of temperature stabilization (near atom frequency standards) with ±1°С accuracy level. The temperature range is maintained by an active gas loop, shutter subsystem with electrical drivers and a set of controlled heaters. All dissipating mission equipment units are located outside the pressurized container on the antenna module in the areas not illuminated by the Sun. Due to the fact that on board a GLONASS-M satellite there is a great amount of mission equipment units operating in the open space environment, the satellite design represents the intermediate stage between pressurized and non-pressurized design. In the nominal mode, the satellite longitudinal axis is continuously maintained pointed to the Earth, with accuracy of 0.5°, the satellite lateral axis is kept in the Sun-satellite-Earth plane with accuracy of ~0.5°, solar array axes are oriented towards the Sun with the accuracy of 2°. The orientation is provided by electrical wheels, periodically unloaded by electromagnets. The propulsion subsystem being a single component thruster subsystem based on the catalytic thermal hydrazine separation method provides the possibility to form control torques within the initial orientation modes of the satellite, and to generate pulses for orbit correction. The orbit correction is performed after the satellite has been injected into orbit, while drifting to the designated orbital slot. High accuracy of the initial correction of orbital parameters allows keeping the satellite within the specified station limits (±5° latitude argument) without need for further corrections during the remaining lifetime. An electric power subsystem based on nickel-hydrogen batteries and silicon solar arrays (30m2 area) provides electric power supply for onboard equipment of continuous stable voltage of 27+1-2 V and the power of up to 1400W, continuously in eclipse and illuminated orbit arcs. The onboard control subsystem based on an onboard digital computer provides data exchange between the equipment via MIL-STD-1553-B buses and performs the functions of control, diagnostic, intersatellite ranging data processing, calculation and generation of ephemeris time data.